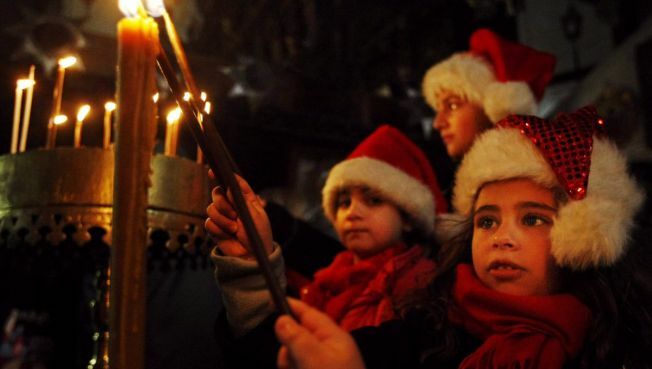 Palestinian Christian children wear festive hats as they light candles inside the Church of Nativity, believed by many to be the birthplace of Jesus Christ, during Christmas celebrations in the West Bank town of Bethlehem on Christmas Eve. BETHLEHEM, West Bank — Christians celebrated Bethlehem's merriest Christmas in eight years Wednesday, with hotels booked solid, Manger Square bustling with families and Israeli and Palestinian forces cooperating to make things run smoothly. The festivities in the West Bank town contrasted sharply with Hamas-run Gaza. While revelers in Bethlehem launched pink fireworks from a rooftop, militants fired more than 80 rockets and mortar shells at Israeli towns and villages, sending people scrambling for bomb shelters. The latest attacks, and an Israeli air strike on rocket-firers that killed one person and wounded two, appeared to have buried an unwieldy six-month cease-fire that expired last week. But 45 miles away, outside the Church of the Nativity, the traditional birthplace of Jesus, good-natured crowds of pilgrims and townspeople gathered for the midnight Catholic mass that is the holiday's highlight. Latin Patriarch Fouad Twal said in an address during the late-night service that true security comes from God. "War does not produce peace, prisons do not guarantee stability. The highest of walls do not assure security," said Twal, the Catholic Church's top cleric in the Holy Land. "Peace is a gift of God, and only God can give that peace." Pope Benedict XVI also spoke of peace between Israelis and Palestinians during Midnight Mass at the Vatican. "Let us think also of the place named Bethlehem, of the land in which Jesus lived, and which he loved so deeply," said Benedict, who is expected to visit the Holy Land in May. "Let us pray that peace will be established there, that hatred and violence will cease. Let us pray for mutual understanding, that hearts will be opened, so that borders can be opened." Earlier, a dozen pilgrims from India, Canada, Britain, the U.S. and other countries sang impromptu renditions of Christmas carols. David Bogenrief, 57, of Sioux City, Iowa, played the trumpet. "Jesus was the prince of peace, and he can bring that peace to you. We pray for you," Bogenrief told a gaggle of children who gathered to listen. In Manger Square, vendors hawked roasted peanuts and Santa hats. Many in the square were Muslims out to enjoy their town's annual moment at the center of world attention. "Bethlehem is like the soul of the universe, and it's like an explosion of love here," said Stefano Croce, 46, a fashion photographer from Rome, Italy. Bethlehem has suffered from the Israeli-Palestinian fighting of recent years, and is now surrounded on three sides by concrete slabs and fences — part of a barrier Israel has built against Palestinian suicide attackers, some of whom came from Bethlehem. The Palestinians see the barrier as a land grab and say it has strangled the town's economy. Emigration has cut the town's Christian population to an estimated 35 to 50 percent of its 40,000 people, compared with 90 percent in the 1950s. Israel has held peace talks over the past year with the moderate West Bank government of President Mahmoud Abbas, and the spirit of cooperation has allowed Palestinian forces a limited measure of independence in places like Bethlehem, under Israel's overall security control. Eyad Sirhan, the Israeli military officer responsible for coordination in Bethlehem, said this week that he can talk to his Palestinian counterpart any time, "24 hours a day," about everything from police patrols to garbage collection. 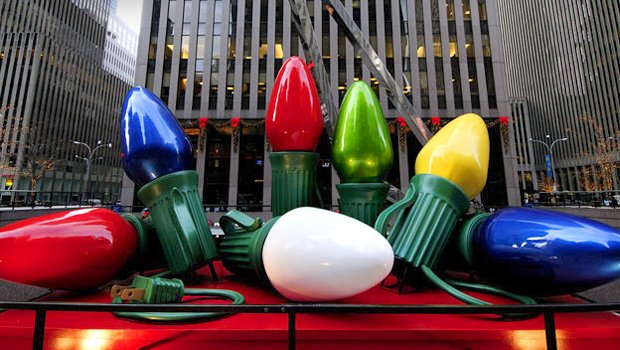 Every detail of the holiday preparations was meticulously discussed by the sides, Sirhan said. Safer times mean the Palestinians have counted more than 1 million visitors to Bethlehem so far this year, a rise of more than 20,000 from 2007. The situation is dramatically different in Gaza, controlled by the Islamic militant group Hamas which seized the territory by force in June last year. An Israeli blockade prevents Gazans from leaving the territory and causes shortages of fuel and basic supplies. The missiles fired from Gaza are inaccurate and Israelis are well drilled in taking cover, so no one was injured Wednesday, though dozens were treated for shock. One target was Ashkelon, a Mediterranean city of 120,000. "We demand the government take action," Ashkelon Mayor Benny Vaknin told Israel's Channel 1 TV. "People are hiding in bomb shelters and our children are taking cover under desks at school. This cannot continue." Foreign Minister Tzipi Livni, running for prime minister in February elections, said in a speech Wednesday: "There is a point where every country and every leadership says — and this is what we say tonight as well — enough is enough." Security officials said a big military campaign against Gaza militants had already been approved but was being delayed by bad winter weather. They spoke on condition of anonymity because of the sensitivity of Israel's military plans. Meanwhile, the military said, it has decided to hook up an improved warning system against missiles — an indication of mounting concern that Gaza militants have dramatically expanded their range. To protest Israel's blockade, the head of Gaza's tiny Roman Catholic community — 300 in a population of 1.4 million — canceled Christmas midnight Mass. Father Manuel Musallem said the parish would instead hold an evening mass.